Justin Timberlake is getting personal in his new book, Hindsight & All the Things I Can't See in Front of Me. Inside the memoir, the 37-year-old Grammy winner opens up about his career, his relationship with Jessica Biel, and the couple's son, Silas. Timberlake and Biel, who recently celebrated their sixth wedding anniversary, keep much of their relationship out of the spotlight. While the private pair often walks red carpets together, they've keep a lot of details about their romance to themselves. But now, Timberlake is sharing some secrets with his fans in his new book, detailing how the couple first started dating and how he later learned he was going to be a father. From his personal to his professional life, let's take a look at the top five revelations from Timberlake's memoir, Hindsight. 1. He Wrote "Cry Me a River" in Two Hours: "I've been scorned. I've been pissed off. That feeling inspired me to write 'Cry Me a River,'" Timberlake writes about the song, believed to be about his relationship with Britney Spears, in his book. "I wrote 'Cry My a River' in two hours. I didn't plan on writing it. The feelings I had were so strong that I had to write it, and I translated my feelings into a form where people could listen and, hopefully, relate to it. People heard me and they understood it because we've all been there." 2. He First Met Biel at a Surprise Party: "We were at a surprise party in Hollywood at a speakeasy kind of a bar, a private club, and we were standing around in a group of people," Timberlake recalls. "I made some sort of sarcastic comment, really dry. Nobody got it except her. She laughed, and I noticed, all of a sudden, and in the way where you wonder if a person's like you, if they have a very dry, dark sense of humor, too. We talked that night. The DJ played 'Lucky Star,' and we danced. And then she was gone." Timberlake writes that he didn't ask Biel for her number, "It wasn't time." But he was thinking about her after that night. Then, the first night of his FutureSex/LoveSounds tour was about to kick off in San Diego and a mutual friend brought Biel to the concert. "My friend brought her to the show. They were with a whole crew of girls, and they all came into the dressing room and hung out," Timberlake writes. "After the show, they were all going back to L.A. and I was going on to Anaheim. I asked them if they wanted to come with me. 'I'll give you a ride, you can come on my bus. If you want...' And they did. Jess and I talked the whole way up, joking around. Before she got off the tour bus, I said, 'Can I have your number.'" From then on, they started talking on the phone while he was on tour. Then, when the Golden Globes came around, they saw each other, "From that moment on, we started dating." 3. They Were Both Still Seeing Other People Early On: Even though they'd started dating, Timberlake writes, "We were both still seeing other people, keeping ourselves safe from getting hurt, from really putting ourselves out there. It took a bit for both of us to admit to ourselves that were were really, really that into each other. When I came back from tour, we spent a month together. After that, I said, 'I really want to be exclusive.' And, somehow, she said, 'So do I.'" 4. 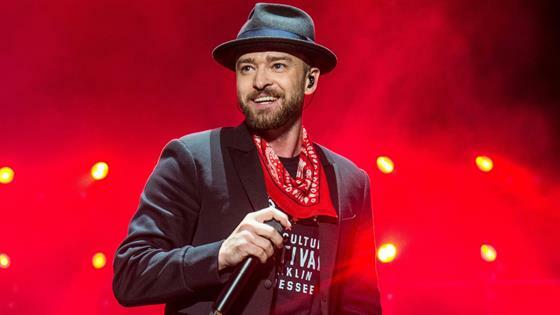 He Found Out Biel Was Pregnant Over Emotional FaceTime Call: "I was on the 20/20 Experience Tour when my life changed forever," Timberlake tells readers. "I was in Detroit and pulling a week or two by myself because my wife was in Los Angeles, but was coming to visit me in a few days. I had just finished a show, and I go into my car and took my phone out. There was a text from Jess, in all capital letters. It read 'Call Me Now.' I FaceTimed her back immediately. She answered with this look on her face, and I knew exactly what she was going to say. Instead, she just held up the pregnancy test, and we both started bawling. I ended the tour early so I could be at home and take care of my family." "My last show was in Las Vegas, on January 2, 2015," Timberlake writes "Three months later, I was a father." 5. Having Silas Has Been the "Pinnacle" of His Life: "The things I have learned from being a father have been profound," Timberlake writes. "It's made me look at relationships in a new way. It's made me think about who my parents are as people, and how that affected me then and has contributed to who I am now—and how all that might affect my child. It makes me wonder how my son will see me when he grows up. It makes me want to be more thoughtful."